My clinical experience is that in America, when people die from cancer, they are NOT actually dying from cancer, but instead, they are dying from the medical TREATMENT itself. They are dying from the chemotherapy, radiation and surgery. AGAIN: They are NOT dying from the cancer—they are being killed by the medical doctors and their medical treatment! Richard Shulze, N.D., M.H. "Pharmaceutical companies spent $2 billion on over 314,000 events that doctors attend...in 1991 the drug industry "gave" $2.1 billion million to colleges and universities for research." 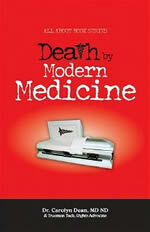 Death by Modern Medicine identifies the tragic aspects of a medical system that, in its short history of about eighty years, has managed to kill tens of millions of victims. Dr. Dean, in her widely circulated paper, "Death by Medicine", written in November 2003, was the first to identify the extent of these casualties. She confirmed that from 1990-2000 about 7.8 million victims suffered - Death by Medicine. By 2014 the numbers had escalated to over 1 million unnecessary deaths at a cost of over 280 billion dollars. Interestingly, this way of covering up the reality of deaths and damage caused by pharmaceutical corporations is becoming more common — In the UK, the case against Dr Andrew Wakefield, the whistleblower in the case of MMR (manufactured in part by GSK), was presented to the public as one of ethics, while the real issue of a damaging vaccine which harmed thousands of children was completely sidelined. If Witty and GKS did learn anything from this case, it was how to get away with culling the population of thousands, this part of their operation went very well but next time they might hope to dodge the fine for undeclared safety data. It makes me sick to my stomach, that while every high school shooting, every soldier killed in a foreign country, every notorious murder is religiously reported by the US media, GSK gets away with killing thousands without a single adverse word. And where are our gallant reporters in all this, whose going to sue them for fraudulent reporting, nothing could be a clearer sign that the media and it’s feather bedded journalists have crossed to the other side of the corporate tracks. THE DR. STARFIELD INTERVIEW By Jon Rappoport the findings on the relatively poor health in the US have received almost no attention. The American public appears to have been hoodwinked into believing that more interventions lead to better health, and most people that I meet are completely unaware that the US does not have the 'best health in the world'. ......Even though there will always be adverse events that cannot be anticipated, the fact is that more and more unsafe drugs are being approved for use. Many people attribute that to the fact that the pharmaceutical industry is (for the past ten years or so) required to pay the FDA for reviews---which puts the FDA into an untenable position of working for the industry it is regulating. ....They (my findings) are an indictment of the US health care industry: insurance companies, specialty and disease-oriented medical academia, the pharmaceutical and device manufacturing industries, all of which contribute heavily to re-election campaigns of members of Congress. The problem is that we do not have a government that is free of influence of vested interests. Alas, [it] is a general problem of our society-which clearly unbalances democracy......Yes, it (FDA) cannot divest itself from vested interests. (Again, [there is] a large literature about this, mostly unrecognized by the people because the industry-supported media give it no attention. .....Please remember that the problem is not only that some drugs are dangerous but that many drugs are overused or inappropriately used. The US public does not seem to recognize that inappropriate care is dangerous---more does not mean better. The problem is NOT mainly with the FDA but with population expectations. ... Some drugs are downright dangerous; they may be prescribed according to regulations but they are dangerous. ...It was rejected by the first journal that I sent it to, on the grounds that 'it would not be interesting to readers'! In 1983, 809,000 cesarean sections (21% of live births) were performed in the US, making it the nation's most common obstetric-gynecologic (OB/GYN) surgical procedure. The second most common OB/GYN operation was hysterectomy (673,000), followed by diagnostic dilation and curettage of the uterus (632,000). In 1983, OB/GYN procedures represented 23% of all surgery completed in the US. In 2001, cesarean section is still the most common OB/GYN surgical procedure. Approximately 4 million births occur annually, with 24% (960,000) delivered by cesarean section. In the Netherlands, only 8% of births are delivered by cesarean section. This suggests 640,000 unnecessary cesarean sections—entailing three to four times higher mortality and 20 times greater morbidity than vaginal delivery—are performed annually in the US.